For the guitarist who already has a toolbox-full of their favorite effects gadgets, the VT15CD has all the features of the VT15FX, except the FX. 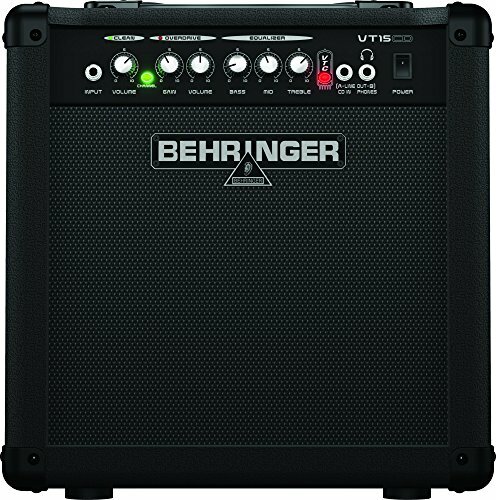 With a Clean channel, as well as an Overdrive channel with 3-band EQ, the VT15CD is all about tone! Ask any guitarist what they want most from an amp and they'll answer with a single word - TONE. That quest for tone drove us to develop our family of VIRTUBE amplifiers. Our proprietary VTC (Virtual Tube Circuitry) gives these amazing amps their in-your-face tube-amp tone. Amps with such rich, harmonic character and buttery tube-like goodness, you'll wonder where we hid the tubes. All VIRTUBE amps have split personalities: one that features dulcet-clean output, and one that drives your tone with an aggressive punch that only tubes, or our VTC modeling, can generate. So when the time comes, you'll be ready for everything from mellow blues to metal mayhem. The secret behind VIRTUBE's incredible sound is our VTC Tube Modeling processor, which exudes the very essence of tube saturation and compression. But VTC does so much more than just generate a cheap copy of a specific amp character. It accurately emulates the interaction between classic tube stages, responding to the subtle tonal changes that occur when one stage hands the signal off the next. The resulting signal is rich in harmonic content and far more true to the nature of tube amps. VIRTUBE's Clean channel is elegant in its simplicity. The sound is open and uncolored and can be tailored to your needs by Volume and the analog passive equalizer. The Overdrive channel features Gain, Volume, Bass, Treble and our proprietary Contour control, with its radical midrange sweep. All this versatility enables you to artfully define your "perfect" tone, from traditional to scooped modern and anything in-between. All VIRTUBE models, with the exception of the VT15CD, come with state-of-the-art effects - and not some cheap-and-cheesy reverb chip, but a full-blown 24-bit digital effects processor with 16 great-sounding reverbs, choruses, flangers and delays. This tasty collection of effects is a must-have for any guitarist and includes room, stage, concert and cathedral reverbs, slap-back and medium echoes, two long delays, plus slow and fast modulation effects - all right at your fingertips. It takes a special speaker to handle all this incredible technology, tube-like tone and brutal output power. That's why we fit each VIRTUBE combo with handmade, heavy-duty BUGERA Vintage Guitar speakers. These babies were custom-designed and handcrafted specifically for the VIRTUBE Series, and are ideally suited for classic sound reproduction.